As a tech start-up veteran, Adam Singer isn’t afraid of risk. 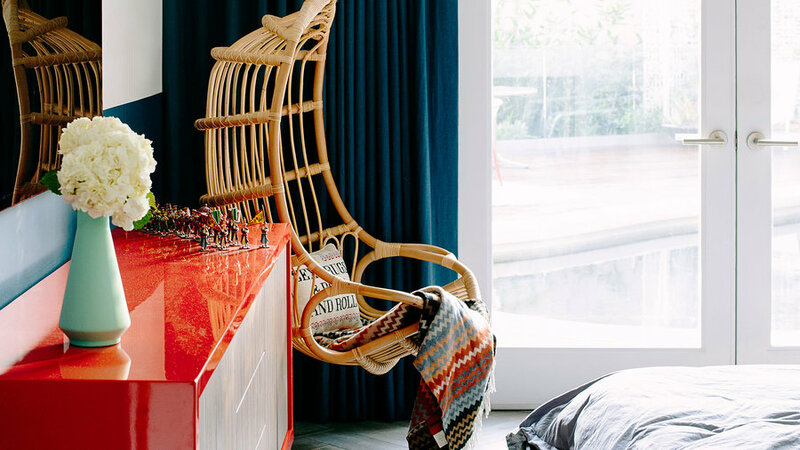 So when he needed a designer to remodel his Hollywood Hills bachelor pad, he hired Caitlin Murray and Caitlin McCarthy ()—because he knew they had the guts to take inspiration from his vibrant art collection and splash color all over the 1940s home. The designers channeled Singer’s boldness into a range of saturated blues and greens. “It’s very ‘me,’ ” Singer says of the lively result. See how Murray and McCarthy did it—and how you can too. A wall of built-ins in the guest bedroom (pictured) got a jolt from peacock blue spray lacquer and brass hardware. Color: Naples Blue 2057-30, Benjamin Moore. To Murray and McCarthy, an entryway is like the opening scene of a mystery movie: It should foreshadow the elements to come. Their device of choice? A striking artwork that features colors found throughout the home. Singer’s original Salvador Dalí print, Lincoln in Dalivision, fits the bill with its avant-garde style and kaleidoscopic colors. 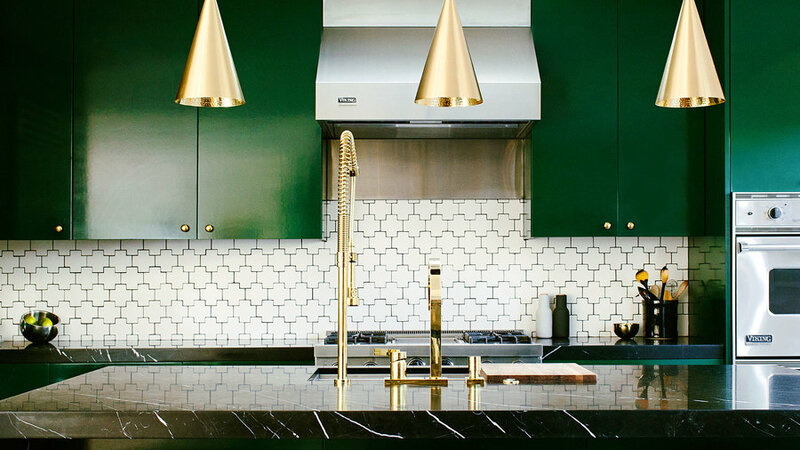 To introduce green, a color not prevalent in the artwork, the designers sourced table lamps from Etsy that match the kitchen cabinets. The midcentury peacock credenza hints at the vintage furniture within and introduces the brassy tones that appear in nearly every room. Credenza: Organic Modernism. Peace sign: Noir. Walls throughout; Decorator’s White PM-3, Benjamin Moore. “It’s important to have a common narrative in an open floor plan,” says Murray, who looked outside for inspiration and chose blue and green to highlight the backyard pool and lush foliage. 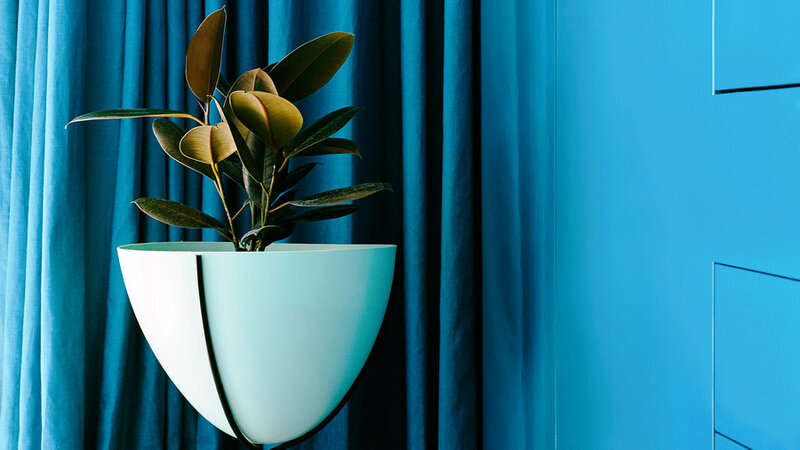 “Blue and green help the home feel masculine without going dark and moody.” She punched up the two dominant colors by varying tone and intensity for each space. 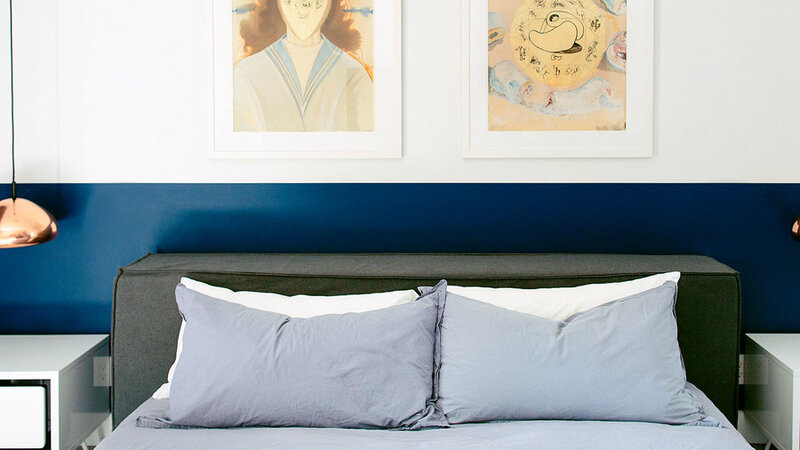 In the living room, a Prussian blue custom sectional serves as the main block of color. Pops of coral and gold, borrowed from the Salvador Dalí painting The Yin and the Yang hanging behind the sofa, add brightness. Lamp: Zuo Modern. Sofa: Custom. Coffee table: Vintage. Rug: Surya. Although Singer wanted to take risks with the design, he was slow to embrace the idea of green kitchen cabinets in high-gloss lacquer. “It was the first thing she showed me, and it was really out there,” Singer says. “I asked her to redo the design with a more neutral palette.” Murray complied—but eventually convinced Singer to okay her original idea after she pointed out that green would read like a neutral because of everything outside the large windows: the trees, the grass, the bushes. “If it were any other bright color, it would feel too bold,” Murray says. Handsome brass hardware pairs brilliantly with the hue. Glam design demands elegant materials, so Murray finished the room with Nero Marquina black marble counters and turquoise stools to bring some blue into the space. Cabinet color: Chrome Green PM-10, Benjamin Moore. Backsplash tile: Ann Sacks. Stools: Lawson Fenning. Pendants: Tom Dixon. Faucet: Rubinet. 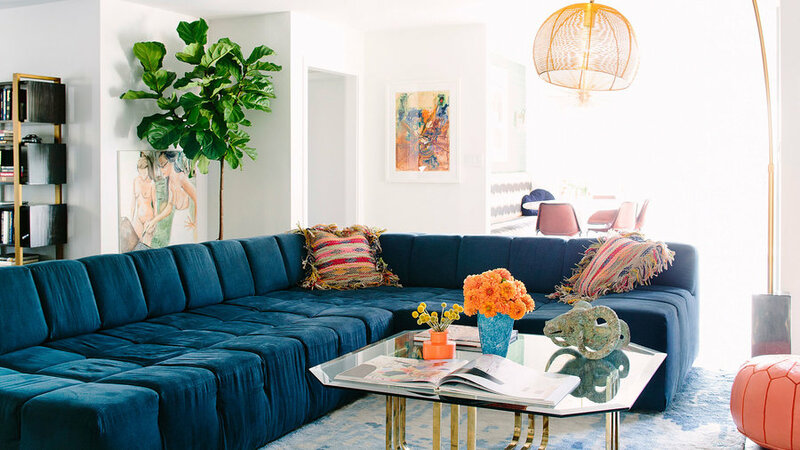 “This space is all about mi lots of great materials and patterns,” says Murray, who started with the aquamarine grasscloth on the wall and then layered from there. She found the perfect print for the banquette, but the scale was tiny, so she created a similar custom fabric on . The gray tile floors, which replaced warped wood, were laid in a herringbone pattern. “The main rule for layering patterns and finishes is that they shouldn’t be too similar—otherwise it will look as if you meant to match them and it didn’t work,” Murray says. That guided her choice of finishes: “The brass chandelier, for instance, is very different from the concrete sconces, which are very different from the matte black chair bases. Brass and nickel wouldn’t have worked—they look too much alike.” Chandelier: Arteriors. Chairs: ABC Home. Art: Custom, screenshot from Jaws. Wallpaper: Stroheim. Table: Design Within Reach. “There’s something comforting about symmetry,” says Murray. “It makes small spaces feel cohesive and cozy.” To strike a balance, she hung copper pendant lamps above matching nightstands, low enough to serve the loungelike platform bed. “Low-profile furniture doesn’t obstruct the view,” she says. A pair of Salvador Dalí prints, a gift from Singer’s late father, hang above the bed. For a modern take on wainscoting, the designers painted the bottom third of the walls sapphire. Wall color: Champion Cobalt 2061-20, Benjamin Moore. Bed: Blu Dot. 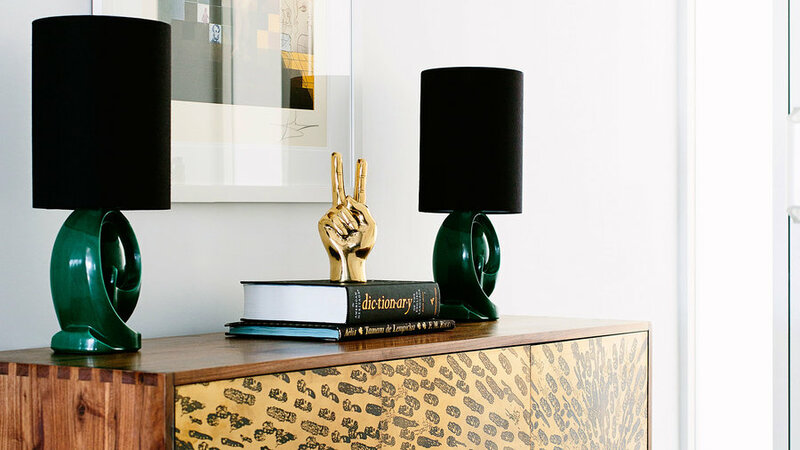 Nightstands: Pangea Home. Pendants: YLiving. Don't be afraid to break with your dominant palette to add a pop of a complementary hue here and there. While this home is swatched in blues and greens, the red credenza in the master bedroom is a reminder that this home is committed to color. Credenza: ModShop. The bathroom is an example of ingredients that blend beautifully for no obvious reason. “Sometimes things just feel right; you can’t explain it,” says Murray. She started with a pixelated floor tile that’s a nod to Singer’s tech profession. 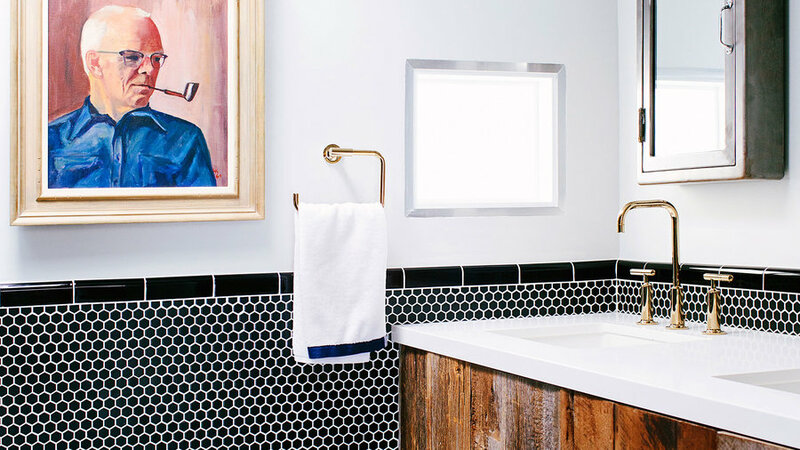 Then she added black penny tile inspired by the home’s era. For the third wild card, the designers clad a vanity in reclaimed wood. The portrait, an Etsy find, came last. It’s random but pulls the bathroom together. “After the kitchen, this is the room guests talk about most,” Singer says. Floor tile: Kismet Tile. Wall tile: Mission Tile West. Faucet: Kohler.